« Walnuts – They’re here ! We’ll be in Seattle on Saturday July 14th for our first farmers market of the season. We’re looking forward to seeing our friends and customers and to spend a little time in the big city. The fruit is just starting to ripen, a little bit later then “normal” but quite a bit earlier then last year, which was the latest we’ve ever had. We’ll be bringing sweet cherries, black and red currants, peas (snow, sugar snap, and shelly) and mulberries. I’m pretty sure that we’ll have pie cherries next week. 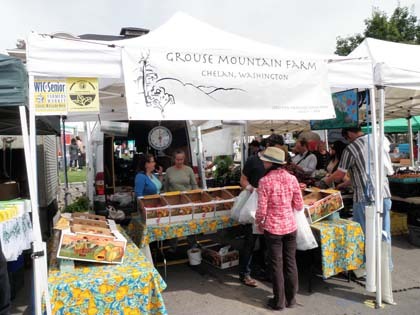 This entry was posted on July 13, 2012 at 6:25 am and is filed under farmers market, Grouse Mt. Farm, whats fresh with tags black currants, cherries, farmers market, food, red currants. You can follow any responses to this entry through the RSS 2.0 feed. You can leave a response, or trackback from your own site. I would like to buy around 10 pounds of the sour/tart cherries for preserving and freezing. I would be making a special trip to the U District FM since it is not the closest to my house. Would it be better luck for them to be available this weekend or the following? Any chance that you’ll have green walnuts?